All of our technicians have electronics training in addition to computer and network disciplines. 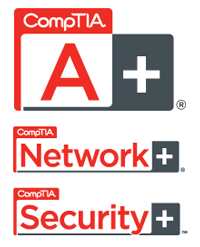 We hold Microsoft and Novell Certifications as well as CompTIA certifications. A comprehensive list of our services is available. We will be honest and frank in all of our communications and transactions with our clients and customers. Period. You can be sure that we will return your call promptly if we are unable to answer it in person. We monitor our business lines consistently during regular business hours, after hours and weekends. When designing, installing and maintaining a computer network, there are many details. Just like building a house, you must start with a sound foundation, and then build up, with the amount or details reaching a crescendo near completion. “We mind the details” from the design stage through the installation stage, to the maintenance stage. Because our work is very detailed, extensive testing once the work is completed is imperative to ensuring a trouble-free installation. We adhere to this discipline, always. We here at TTI believe that customer service is just as important as our expertise. We are eager to educate our clients so they can understand the concepts we are presenting. By doing this, we empower them to make informed decisions about the direction that “our clients” want to take with their business network. We are a service based business. As such, we leverage our expertise to the benefit of our clients in all that we do. You can be assured that a decision to purchase equipment, software, and peripherals from our company will be accompanied by a well thought out recommendation before the sale and exceptional service after the sale. Customers appreciate a company that cares about quality. Our clients receive a follow-up call from their TTI technician after any work is completed to inquire about their satisfaction with any work performed. Let us take the responsibility for the computers and network so you can concentrate on your core business.